PLEASE LET US KNOW BY PHONE OR EMAIL IF YOU ARE INTERESTED IN PURCHASING, AS THIS DESIGN IS MADE TO ORDER, THANK YOU. What is Trash Polka? “Trash Polka” is an art style in modern Tattoo culture started by a small group of artists working in Germany, which has since spread to the USA. 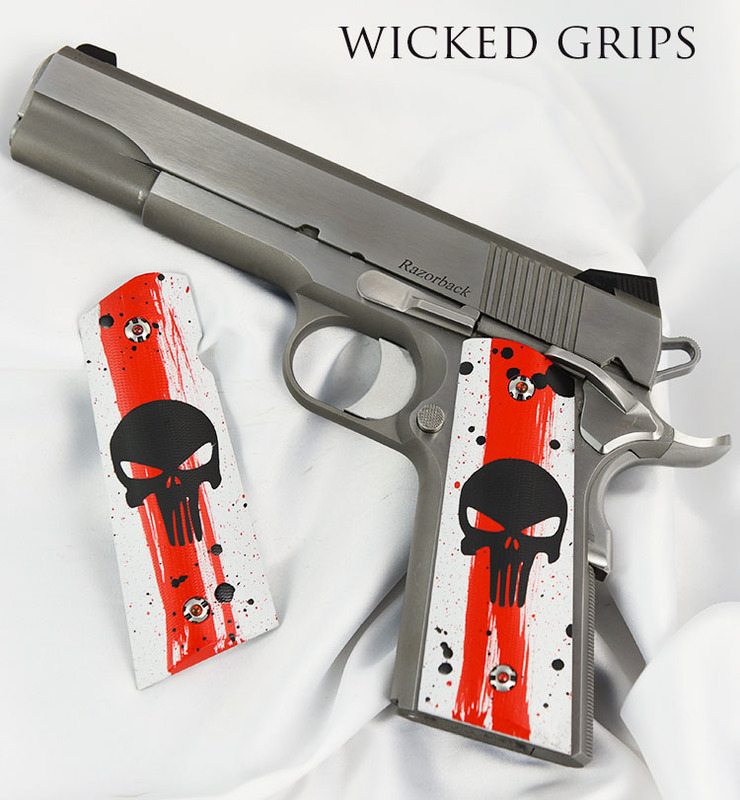 Based on bold color and realism versus abstract, it offers a vivid graphic novel art feel to our grips. We have always tried to bridge tattoo art culture with Gun culture, as both are uniquely American. 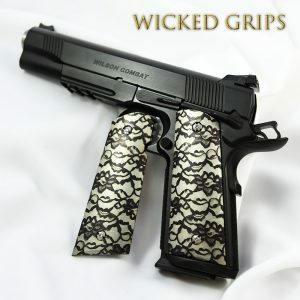 Like a tattoo, each set of grips we make is based on the idea that art should be one of kind, and not mass produced. We work to limit production of our art so that each customer gets something truly special. These photos are an accurate representation of the set you will receive. Each set is a one of a kind.. never to be exactly duplicated set. 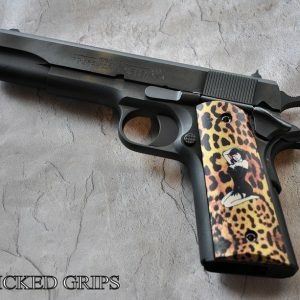 Artist series grips are created by a member of our staff, Lee Hagedorn. 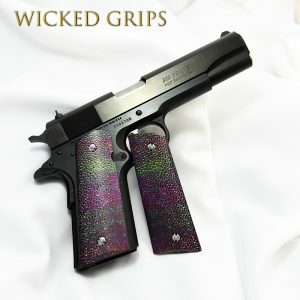 Lee has an extensive background in the art world as well as in the gun world, bringing a unique vision to his craft. 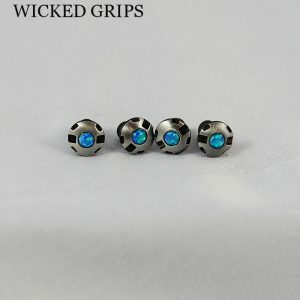 Lee creates each set one at a time, at a level of quality and art that a factory just cannot match. 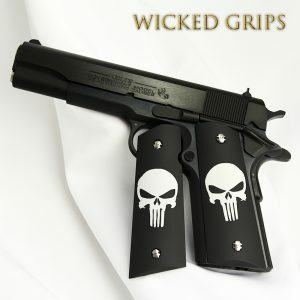 THIS GRIP SET WILL FIT STANDARD CONFIGURATION 1911 FULLSIZE PISTOLS… GOVERNMENT AND COMMANDER.. THAT USE THE TRADITIONAL GRIP. DISCREETLY FIT FOR AMBI SAFETY. PICTURED WITH OUR RED OPAL GRIP SCREWS, NOT INCLUDED. If item is out of stock, please contact us by email or phone, and we can set you up with an order. COMES PACKAGED IN OUR EXCLUSIVE COLLECTORS TIN!